Flexible track is a quicker, easier, option for track work but comes with its own problems. Here are the 9 best tips from the collective wisdom of the internet on how to properly lay flexitrack and take your track work to the next level. Let me first say that this guide to laying flexi track is about the physical elements of cutting, joining and laying flexitrack. It assumes you’ve already worked out the plan for your track work and mapped this to the baseboard so you know where the track will go. If you haven’t done this go get yourself one of the track planning software programmes and work your layout out first. Not doing so it a shortcut to wasted track and frustration. Now, once you’ve got a track plan, you can start to place and fix your track and this is where bendable flexible track comes into it’s own. Forget positioning, joining and fixing small sections of track step-by-step. With flexi track you can lay huge runs of track in minutes and without joints every few inches the electrics will be more reliable and there’s less opportunity for derailing. Having said this however it’s not all plain sailing and there are three main areas where modellers struggle when working with stuff and trying to lay it properly. When I first started using flexi track I thought bending it to fit my track plan would be the least of my worries but it’s surprisingly difficult for the unwary. Just taking the track and bending it without support your hands — as I did when first starting — is a sleeper away from ruined track. The Rails break free of the sleepers and it’s all too easy to get the degree of curve wrong and having to redo it all. Repeat this a few times and its easy to end up with track that’s full of odd twists and bends that both looks wrong and is a nightmare for your trains to travel over. Putting it on the baseboard keeps it flat to stop it twisting. Before getting round to joining and fixing flexi track in place it will first need cutting to the right lengths. My favourite way of doing this is with my trusty Dremel and a cutting wheel. I position the various sections in place (pinning them down with a screw between the sleepers as I cover here) to hold it in place and then cut the rails to the required length. The key for flexi track is, as with bending, to keep the track flat and support the rails as close to the cut point as possible. Otherwise the track can twist while being cut which can cause the rails to separate from the sleepers or produce angled rail cuts that the rail joiners won’t slide onto. As such, I not only secure the track with screw prior to cutting but use the adaption of a technique mentioned here on RM Web. Essentially, this is to have a small hand-made wooden jig. This is no more than a small block of wood with grooves cut for the rails. Placing this over the track, sliding it up to the ends and holding it down or clamping it while cutting the rails with Dremel ensures they can’t move and a good rail profile for the joiners to fit to is achieved. Although this tip is primarily about cutting Flexi track to size it’s also worth noting of the advice from Atlas forum. Members there suggest pre-soldering lengths together to create longer stretches which avoids having awkward joins in the middle of curves. This leads me neatly to the next tip on joining Flexitrack. If you have curves on your layout you’ll quickly realise that joining sections of flexi track together or coming straight off a curve into a straight section is a lot harder than with normal track. The rails of flexi track want to straighten out at the ends so if you’re bringing two curved sections together it’s easy to get kinks at the join. It’s also very easy to end up with curves that are differ from the radius of the overall curve and which then causes problems for the trains as they transition from one radius to another. Over on the American Model Railroader various forum members suggest pre-bending the track so it doesn’t want to straighten out when you’re fitting it and soldering joiners. This helps reduce the tendency of the track to flex and reinforcing the joiners so they hold the rails more firmly. In my experience I’ve also found this advice from nscale.net handy: “Lay the track from the middle of the curve, working it in both directions as you form the desired radius… then cut the ends even and join the next length on straight away.” Working out from the middle of the curve rather than working into it always results in better curves when I do it. Another challenge with joining flexi track is that the sleepers often run right up to the end of the rails and getting rail joiners on can be difficult. There’s a discussion around this on the Hornby forum. The solution there is to remove the last sleeper completely while fitting the rail joiners and then modifying the sleeper so it can slide back up under the rails once in place. You’ll need to trim off the chairs that hold the rails on the sleepers and may need to file them down slightly so they slip under the joiners but this makes joining the track much much easier while still giving a pleasing look. On the subject of joining track, remember to use an easement between straight sections and curves regardless of which is flexi track. This is covered in detail on GScaleCentral. (This site is for garden railways but they have many of the same challenges). Essentially, going from straight into or from curve can cause problems for your rolling stock as it navigates the difference. Instead you should gently transition between the changes in direction, starting the curve gently and easing into the actual radius of the curve. Do you use flexi track? What’s your secret to laying it? Share your best tips below in a comment. 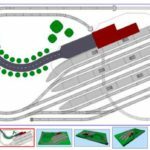 > This article is one of my free guides on constructing a layout from train set to model railway. Click on the link for more free tips. It is not always necessary to cut Flexitrack. I mean just think about this for a moment. Does it really matter that opposing rail joints are parallel and opposite to each other? It won’t affect running and nobody seeing a layout, (other than the person who laid the track), will know. It is true that it might be necessary to make a cut to one rail, or even to both rails when completing the final joining connection on a layout, but this usually involves cutting only a small section of rail……or indeed sleeper web. The mistake some people make is that they believe it is necessary to always cut rails to ensure a parallel joint for both rails. This method can, result in considerable wastage of rail / track. I constructed an outdoors ‘G Scale’ layout with a friend some years ago using Flexitrack and I think we only made one cut to one rail when we completed the track laying. This stood up well to whatever the season threw at it over an eight-year period and we never had any problem with rail shrinkage or expansion. Obviously temperature differences and their effect on track is not usually a problem with an indoor layout. Just an observation which may help others.